Nematologists will welcome this counting slide. The grid is on base of slide, the base of the slide has a primary grid system of solid lines outlining 24 boxes each 5 mm square, plus a secondary grid system of broken lines for refined calculations at different magnification if needed. 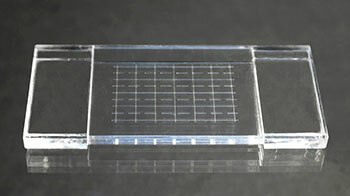 Used for counting eggs and vermiform stages of plant parasitic nematodes. Some customers prefer this slide without a top piece for easier charging and cleanup. Please specify if you prefer no top.